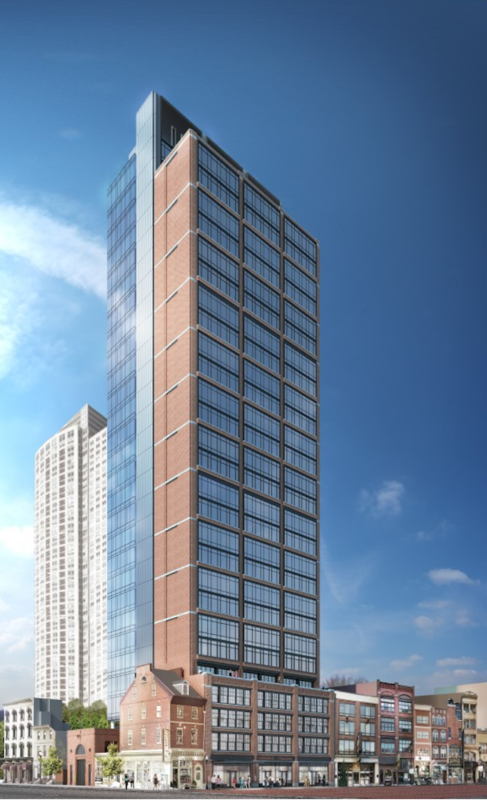 Last night representatives of the national suburban developers Toll Brothers presented their latest renderings for a 115-unit apartment tower in the heart of Jewelers Row to the Washington Square West Civic Association. As reported by PlanPhilly, the five threatened buildings–all dating back to the 18th and early 19th centuries–will be demolished if the plan moves forward. 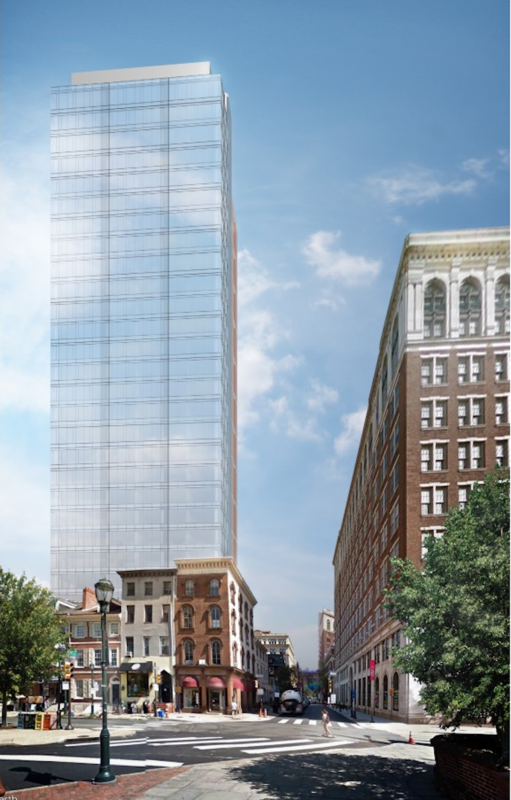 The glass-lined tower, originally 16 stories, now looms over the roofline at 29 stories in the updated proposal. 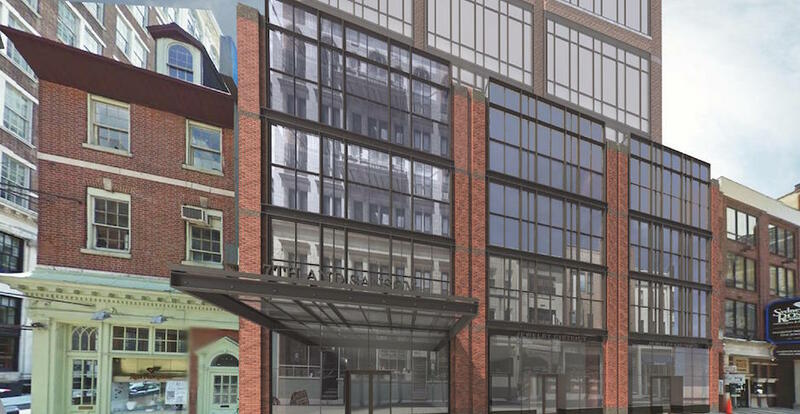 The plans includes a four-story, brick-skinned podium with 2,600 square feet of retail space. The block, America’s oldest diamond district, is not listed on the Philadelphia Register of Historic Places as an historic district and is currently zoned CMX-5, allowing dense, new construction and by-right development. Much to the dismay of neighbors and preservation activists, Toll Bros. will not preserve the historic facades of 704 and 706-08 Sansom Street, as the company promised in its original plan. Last September the Preservation Alliance for Greater Philadelphia submitted nominations for 704 and 706-08 Sansom Street for placement on the local register in an emergency effort to protect the buildings from demolition. The Historical Commission postponed ruling on the nominations the following November despite overwhelming support from the media, the public, and the Committee on Historic Designation, which voted in favor to recommend the properties for legal protection. 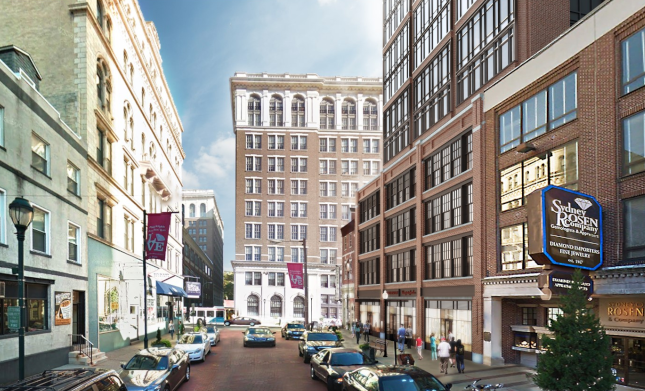 In a statement to The Inquirer, Mayor Jim Kenney said, “I do believe that Toll Bros. remains committed to maintaining Jewelers Row as a historical, cultural gem.” The $100 million residential project will go before the Civic Design Review committee in February. This is heartbreaking. Once these buildings are gone, a piece of Philadelphia’s history is gone, never to return — lost forever. Philadelphia is unique among American cities, and moving toward the soulless landscape accepted elsewhere: row upon row of bland glass boxes with no character, diminishing that which makes Philadelphia Philadelphia. Allowing this to happen is criminal, a knife in the heart of the distinctive nature of a grand and singular city. It appears that the tower should not be visible from the street, and that the four story frontage blends fairly well. If the developer bought the property and planned to develop it within the legal constraints, why such protestations? In my experience these protests usually arise from someone losing a view or some such NIMBY self-interest. Neither am I a neighbor, nor have I any self-interest in this save for believing Philadelphia is losing what makes the city unique. It’s just plain laziness that this developer won’t keep the buildings as part of their plan . I am almost speechless. There is absolutely no art in this proposal. It is UGLY. But hey, someone will make some money off of it. Besides not even coming close to fitting in or honoring tradition, are these glass towers designed in anyway that is sustainable or green that looks to future generations? Think not. I would imagine that Troll Bros headquarters are part of the suburban sprawl across farmland and woods too. I don’t get it, why not just keep the original facades and then build the new behind, up and down?